Albus' surgery went fine. He's pretty drugged up this evening, but hopefully all will be well. He has to wear the bandages for two days then they will be removed and if it looks good he can go without them. Stitches will come out in two weeks. He thanks you for your thoughts....I think at least...it was pretty slurred. I'm glad the surgery went well!! Drama and I wish him a speedy recovery. Glad everything went okay. Get well soon, Albus! Thanks...I can't wait for the bandages to come off so he can move around a little better. Yay Albus! I hope the healing goes quickly. I just noticed yesterday that our Daisy has a hematoma on her left ear! After doing a little 'net research on it, I can see how it happened -- she tends to get itchy ears from allergies, especially in her left ear, and she scratches and shakes her head when they're bad. I hope Albus recovers quickly! Good luck to her! Albus probably got his scratching. He has a habit of scratching everything when he wakes up in the morning. I wondered yesterday why the vet didn't tape the ear up as if it had been cropped, but now that you say that I'm glad she didn't. He has slept under the covers all night. He of course milks it. He acts like he's coming up to give you kisses, but really he just wants to rub his head up against you :D He keeps getting in trouble for rubbing it on other things because I want the bandages to stay on if at all possible. Oh good, I'm glad he's able to act normally without too much discomfort. I can totally picture the sneak-rub, too! Clancy has allergies that make him lick/chew his feet rather incessantly, and he actually has gotten to the point where he will take a few toys and pile them up around his paw, trying to hide the fact that he's actually chewing his foot! They are crafty little devils! And boston benders aren't good for controlling snoring :D He kept me up most of the night. 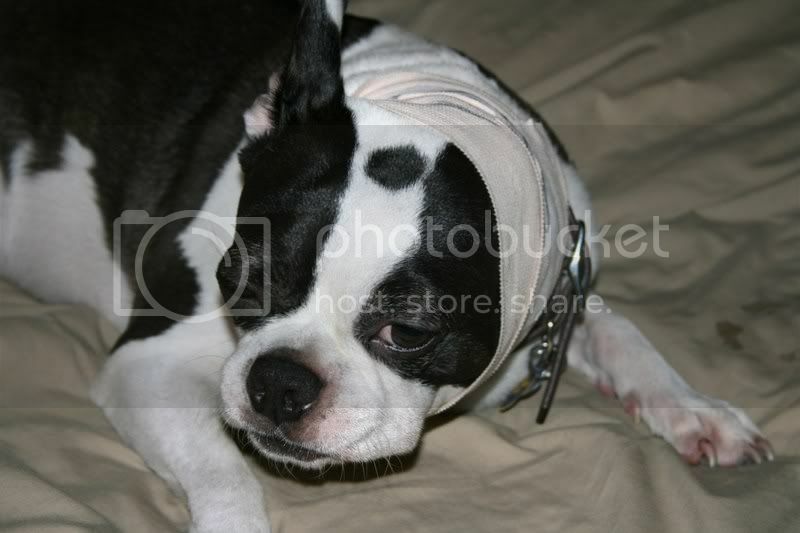 Aww his poor bandaged ear! I am glad he made it through surgery. I will think good recovery thoughts! He's doing ok...he got rebandaged by the vet today but decided to take it off this evening. I'll call the vet in the morning and see if it needs to be bandaged again. Does he have to wear a cone of shame or anything like that to keep from scratching it?